At Closets of Tulsa, our favorite custom closet feature is also one of the simplest: The closet valet rod. If you're new to the closet valet rod, I guarantee you'll be surprised at how often you use it. This is one accessory you almost can't have too many of. Deciding what to wear or packing for a trip? Valet rods hang clothing parallel to you, like a retail display. This makes it fun and easy to quickly see what works and what doesn't. Pair pieces on your closet valet rod to put looks together. Don't forget about your jewelry, tie, hat or handbag—hang it all as a unit so you see the big picture. Display tomorrow's outfit on your closet valet rod to spare yourself some fuzzy morning decision-making. This time-saver can help you or a loved one of any age eliminate chaos and live better. When you start the day with an efficient routine, a sense of readiness and ease come more naturally. Use your closet valet rod as a holding station to keep your closet floor and other surfaces free of clutter. Easily hang your coat, hat or handbag instead of letting things pile up. Or, use your valet rod as an organization station to put away laundry or dry cleaning, see what you have, and find a place for each item. See what I mean about never having too many of these? where you can easily inspect them. Locate a valet rod near your dryer or ironing board to move garments directly onto hangers while they're still fresh. If you steam your clothing, hang a valet rod high enough to accommodate. The closet valet rod is also an unexpected place for a thoughtful note that won't get lost among the bills. Post encouraging words for yourself or a loved one before a big day, or leave a fun surprise to celebrate a promotion or the first day of school. 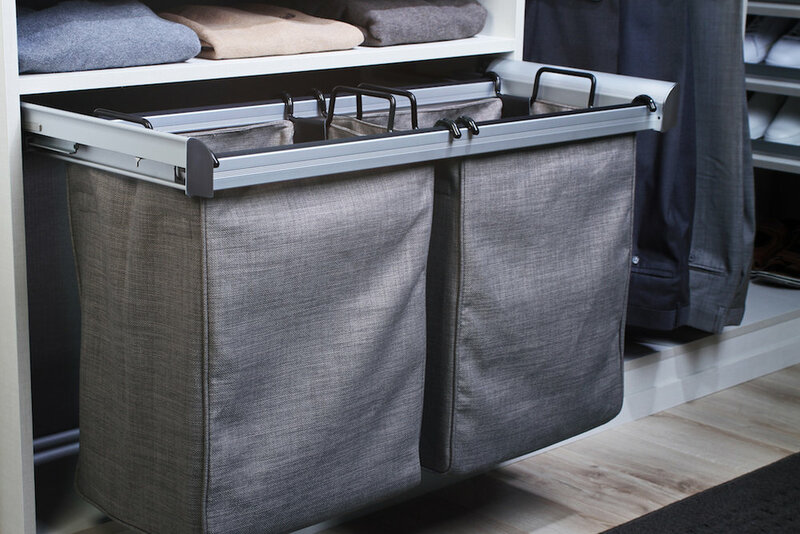 If you've found a clever or surprising use for your closet valet rod, we want to hear about it! Comment below, tag us on Facebook, or shoot me an email at jane@closetsoftulsa.com. We can’t wait to hear from you! Meet Tulsa’s closet experts in your own home to see what’s possible! Request your FREE consultation and 3-D closet design today. How Does it Feel to Shop Your Closet? Visualize walking into your favorite boutique this time of year. The items on display are for the season ahead—not the weather that’s already come and gone. The space feels fresh, relevant and inspiring. Your closet should bring you the same excitement and anticipation. You’ve invested a lot in your wardrobe; why not make it feel like a shopping trip every time you open the doors? This walk in closet organizer creates a well-defined shopping zone. A change in seasons is the perfect time to give your closet a mini-makeover. Relocating storage for clothes you're not wearing now reserves your line of sight—your shopping zone—for day-to-day use. The custom closet above has a well-defined shopping zone. Before you store last season's wardrobe in full, do away with what no longer suits you! Why wash, dry clean and make space for items you won’t be thrilled to rediscover next season? Seize the moment while you still remember what worked and what didn’t. Which outfits made you feel fantastic? What faded, stretched out or just didn’t fit? Part with the latter so you’re only storing items that have earned their place. If space permits, use storage boxes on garage shelving to store off-season clothes. If your garage is overflowing, we can help with that, too! Call Closets of Tulsa for garage storage ideas. If space permits, neatly store off-season clothes on garage shelving or out of sight. (Here are some helpful tips on preparing clothes for storage, and why cardboard boxes belong in the recycling bin.) Choose a spot where the items fit comfortably. If possible, leave the top of your closet shelving and the floor of your closet clear. Empty space gives your brain a break and directs your attention where it matters—your shopping zone! If possible, simplify your space by leaving the top of your closet shelving and the floor of your closet clear. If storing off-season clothes out of sight isn’t an option, try storage boxes and baskets on higher and lower closet shelves. Or, simply create a shopping zone by rotating off-season items to the periphery. In small spaces with less flexibility, store off-season clothes in storage boxes and baskets on your closet shelves. Relocating off-season items creates instant space in your closet. Defining your shopping zone in this way helps you see and regularly re-evaluate what you have. As a result, you’ll wear more of what you love (instead of buying more of it). Try it! You’ll notice yourself developing healthier habits around keeping and getting rid of things.